Do you have a little free time over the Christmas break? 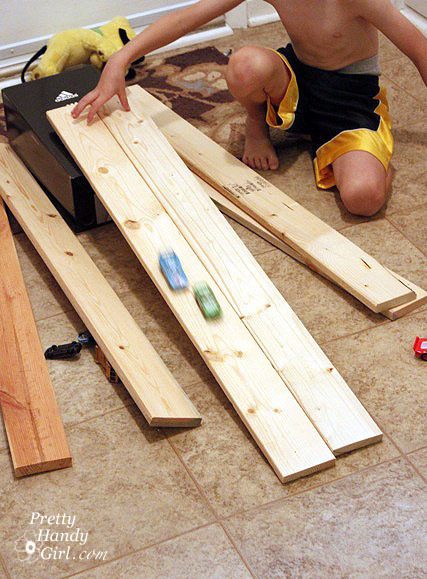 How about taking some time to make a wooden racing track with your kiddos! If you have boys, I’m sure you have Hot Wheels cars in your home. They go hand-in-hand. My boys play with their race cars for hours! They have several of the plastic tracks. And even a curly-Q racing ramp. But, honestly they seem to play with my scrap pieces of wood more than the plastic tracks. 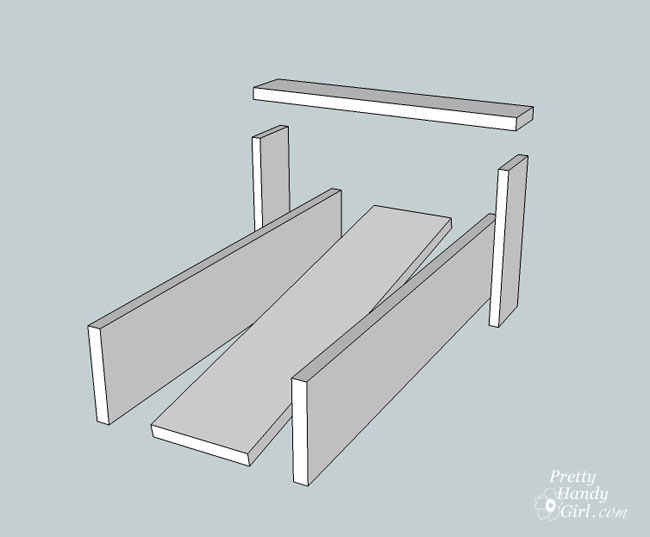 Chances are, if you or your spouse build things, you will have all the scraps of wood on hand to make this racing ramp. Start by cutting all your boards to length. 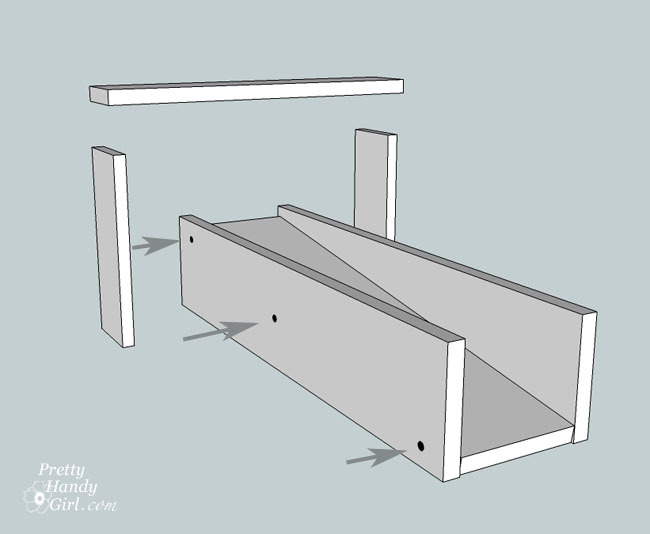 Grab the ramp board (1 x 6 x 33″) and cut one end of the ramp at a 30˚ angle. Glue the narrow strip onto the center of your ramp using a small amount of Gorilla Glue. Clamp the strip and add a few 1″ finish nails to secure the strip. Drive a few screws through the side walls and into the ramp with your drill. Line up the tower sides approximately 2″ from the back edge of the ramp walls. Then secure them in place with a few more screws. Drill a hole into each tower side large enough for the 3/4″ dowel rod to fit through. 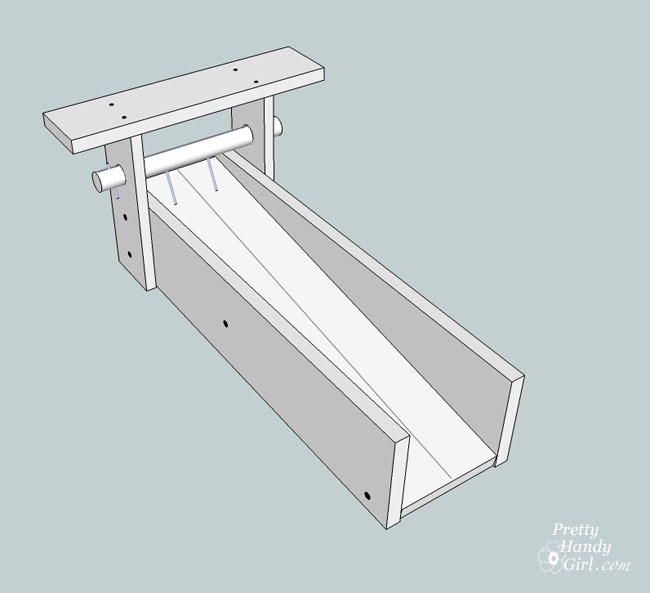 Slide the dowel rod through and center it on the ramp. 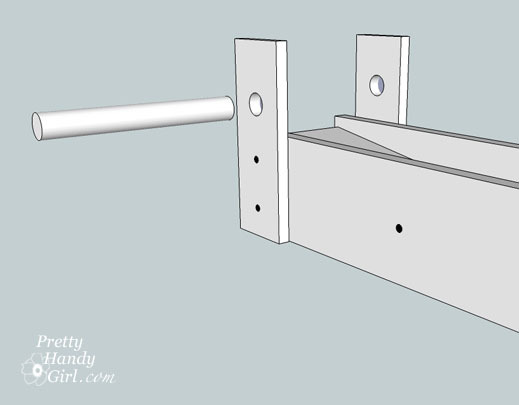 Mark the location of the center of the left and right tracks onto the dowel rod. Measure the distance between the dowel rod and the ramp. Use this measurement to cut 2 pieces of 1/8″ dowel rod 1/2″ longer than that measurement. Mark the location where the dowel meets the outside of the tower wall. Drill a hole all the way through the large dowel rod. Insert the 3/4″ dowel rod through the holes in the tower walls. Glue the 1/8″ cut dowels into the halfway holes. Then cut and glue two more 1/8″ dowels to go through the 3/4″ dowel on the ouside of the tower walls. These will anchor the large dowel rod and keep it from slipping out of alignment. Nail finish nails through the tower roof and into the walls of the tower. Now it is time to add some pizzazz! Ka-chow! I lightly sanded the wood race track. Added a coat of primer and some red and yellow spray paint. Then I cut out a flame design using ScotchBlue painter’s tape (4 pieces overlapping) and an x-acto knife on a cutting board. I gently lifted the tape and adhered it to the side walls. What do you think? Do I have a shot at a job on Orange County Choppers??!! The “logo” on the top was made by pressing letter stickers over the primer, then I taped off around the words and sprayed some red and yellow spray paint. The lines are made with black graphic adhesive lines. I hope you will make one of these for your little stunt driver. My son saw this and he oooed and awwwwed over it. Guess what we are going to try and tackle? It looks great and fun! This is awesome – simple but elegant. I love the flames paint job! Thanks for this fun tutorial. I can’t wait to give it to the little guy we made it for. Great idea and nice documentation! I’m sure your kids are having a blast…!